Had to get up early this morning as Jacob had an Athletics meet for the Air Cadets. Not one to get up and then go back to bed, I decided that today was a baking day! 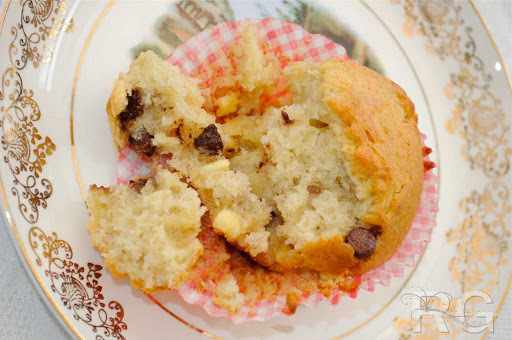 3 lots of muffins baked: Cheese & Red Onion, Philadelphia Blue (made up recipe but tasting good) and these, my banana and choccie chunkie muffins. Those out there who LOVE Masterchef as much as me will know James Perry AKA The Tattooed Cook. Well, James tells me that he struggles to make light and fluffy muffins, so at his request, I’m sharing my recipe with both him and you all out there. You can see that the inside is really light, well risen and perfectly cooked. (Click on the photos for a better look if you like). 1tsp (5ml) bicarbonate of soda. 4-6oz (110-170g) white/milk chocolate chips/chunks. 3 large, well ripened bananas (about 1lb/450g) mashed. 3floz (90ml) corn oil (you can substitute melted butter for this, but remember the calories!). 2floz (60ml) milk (to reduce a few calories, you can use water instead, I suppose). Oven: 200°C degrees (though I set my fan oven to 170°C). 1. Prepare your 12 cup deep muffin tin by lining it with paper cases. 2. In a large bowl mix the following: flour, baking powder, bicarbonate of soda, salt, sugar and chocolate. Mix these together thoroughly with a fork to get some air into the dry mixture. 3. In another bowl mix together: Mashed bananas, beaten egg, corn oil and milk. 4. Make a well in the dry ingredients and add the full contents of the wet mixture. Mix together quickly for no longer than 20-30 seconds until combined. Make sure that you scrape the sides and the bottom of the bowl properly to incorporate all of the dry mixture but DO NOT BEAT the mixture or worry about small lumps. 5. Fill each muffin cup to about 3/4 full. This will then make 12 muffins. 6. Bake for 20-25 minutes until the tops are slightly browned and spring back when touched. 7. Transfer the cakes to a cooling rack until cold. a) Buy bananas when they’re reduced in the supermarket because they’re over-ripe and they’ve gone a little bit brown on the skins. These will give you the best, sweet flavour as the carbohydrate in the fruit will have turned from starch to sugar (which is why ripe bananas are easier to digest too). b) You can freeze bananas for future use in baking. The skins will go very dark brown/black but the fruit inside will stay creamy coloured. If you do freeze bananas, make sure you defrost them thoroughly in a container as they WILL ooze juice. c) Do NOT overmix the wet and dry ingredients together as this will start the chemical reaction with the gluten in the flour and cause your muffins to become dense &amp; heavy. d) Bake the muffins immediately after mixing as, again, a chemical reaction will start between the baking powder/bicarbonate of soda and the wet mixture. If you do follow my recipe to make yourself some gorgeously light, fluffy and incredibly tasty muffins, please come back and leave me a comment and tell me how they turned out. A photo of your creations would be great too!